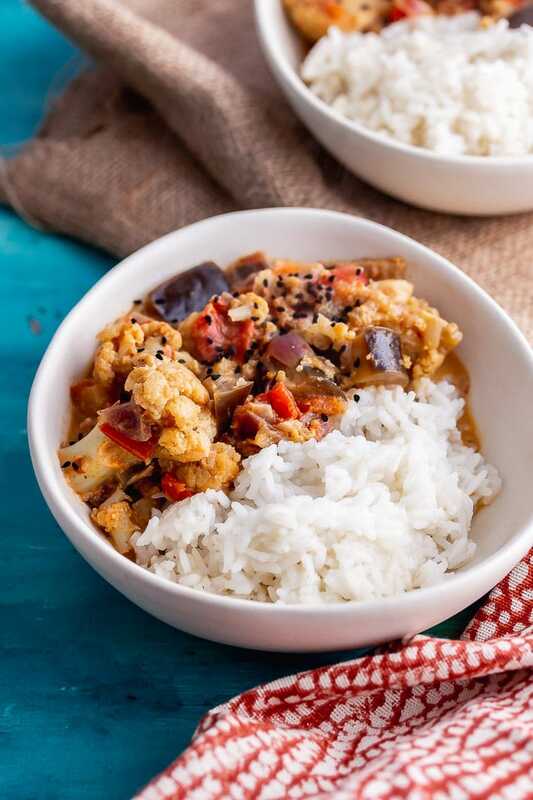 This pressure cooker vegetable curry is easy, healthy and the perfect way to pack in loads of veggies! 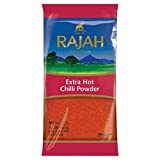 Make it as spicy as you like and add in any veg you have on hand. 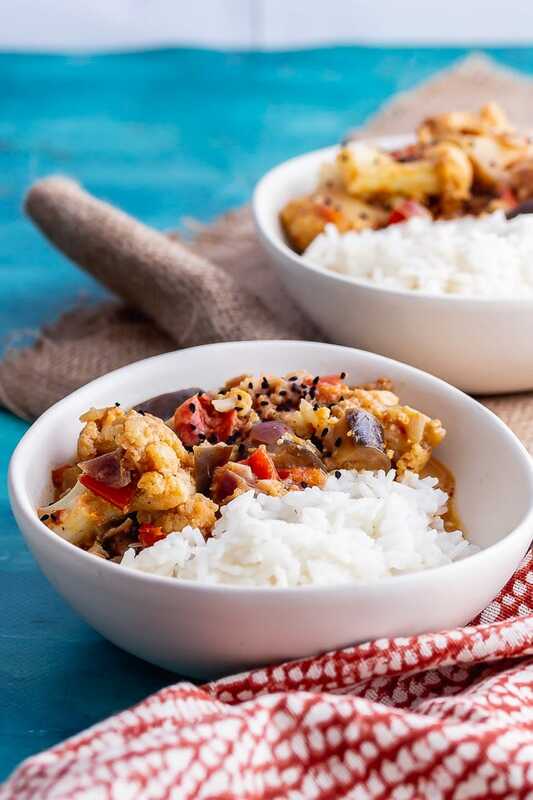 Here’s a healthy curry that you need to add to your weekly meal plan! 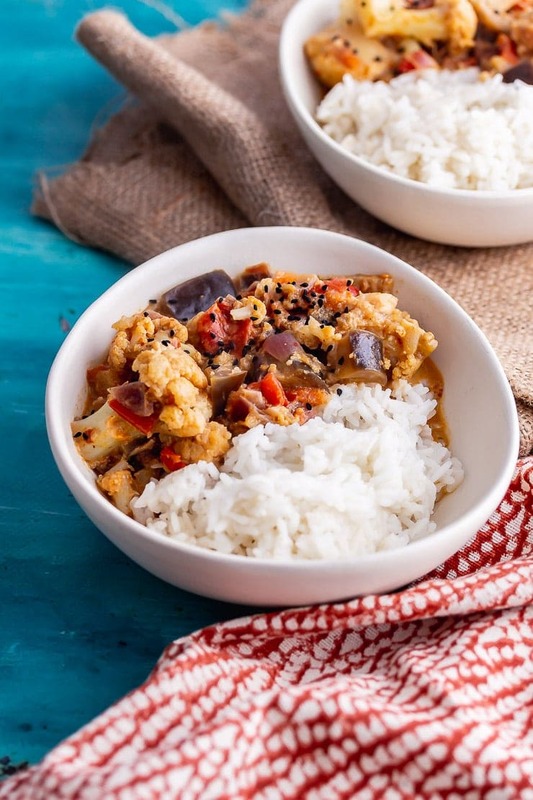 Vegetable curry is one of my go to dinners when I’m struggling to think of a good dinner option. I love how easy they are and they always have so much flavour. 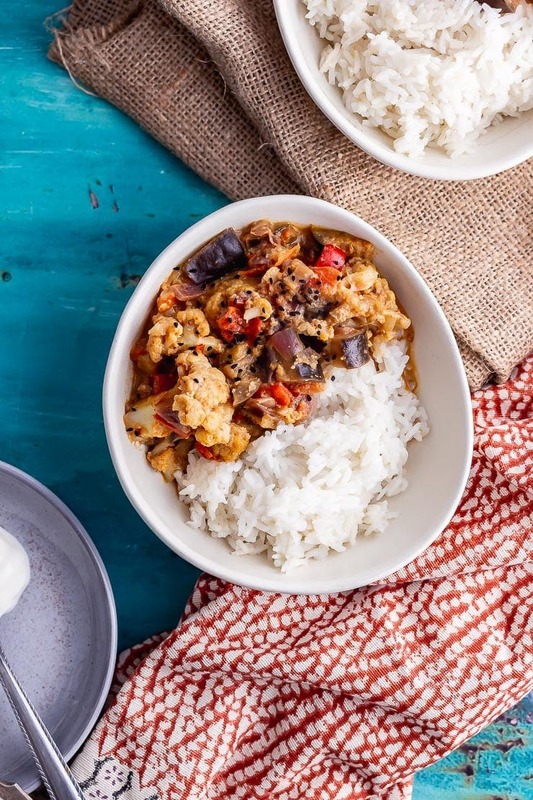 Whether it’s a coconut curry with sweet potato or a creamy cauliflower curry, it’s the kind of recipe that it’s great to keep in your back pocket for a busy day when you need dinner fast. 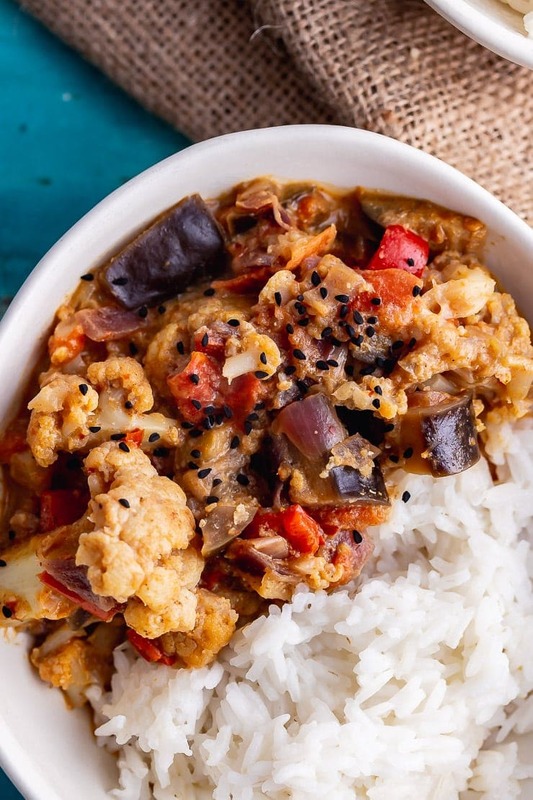 This pressure cooker vegetable curry is really one of those dream weeknight recipes. 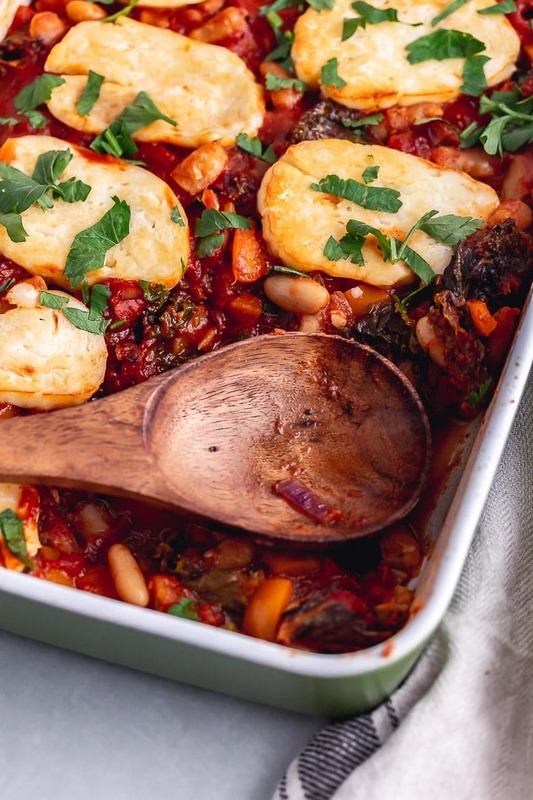 Once you’re got the recipe down you can switch in any vegetables you like or have that need using up so it always feel like you’re having a different meal. Ginger & Garlic: I like to use pastes because I can’t be bothered with the peeling and chopping! Fry the aromatics: Set the pressure cooker to the saute setting and add the oil followed by the onion, garlic, ginger and chilli. Add the spices and vegetables: Add the pepper and fry until softened then add the spices and stir to coat. Add the rest of the vegetables followed by the vegetable stock. Cook under pressure: Place the lid on the pressure cooker and cook for 3 minutes then serve with rice. 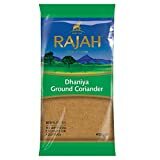 What to serve with vegetable curry? I love this curry served with rice and maybe some naan bread if I’m feeling extra hungry. If you prefer you could try a different grain if you like. 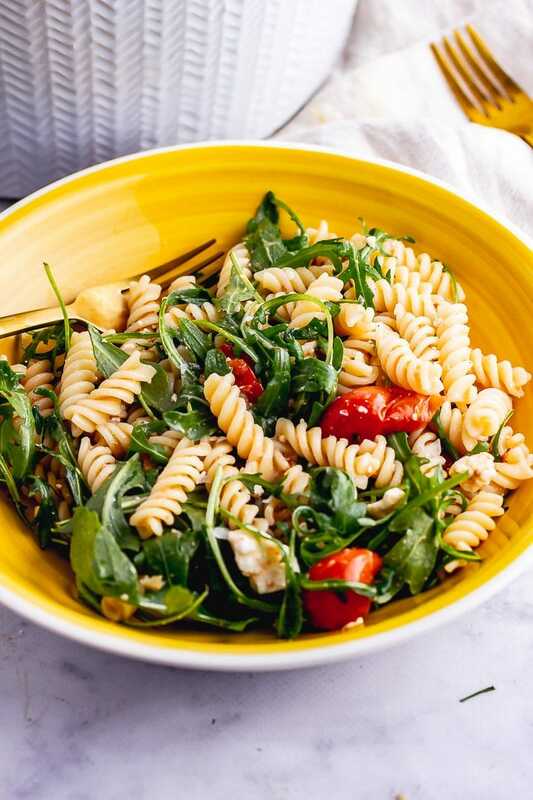 What pressure cooker should I use to make this recipe? I use a pressure king pro which I love but you can honestly use any pressure cooker. Most of my recipe are cooked under high pressure so if you don’t have the same settings as the ones mentioned in the recipe then cook on high pressure for the time instructed. 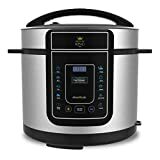 If you have the same pressure cooker then grab all my pressure king pro recipes. 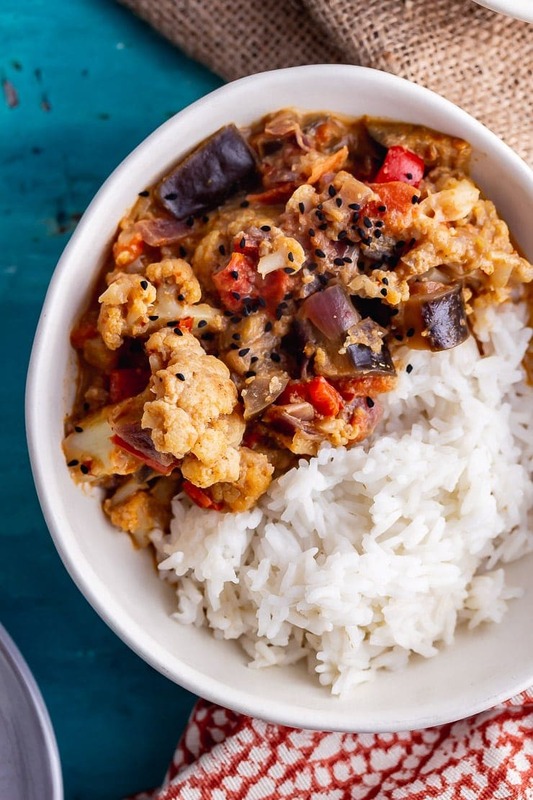 Can I make this vegetable curry on the stovetop? Yes! 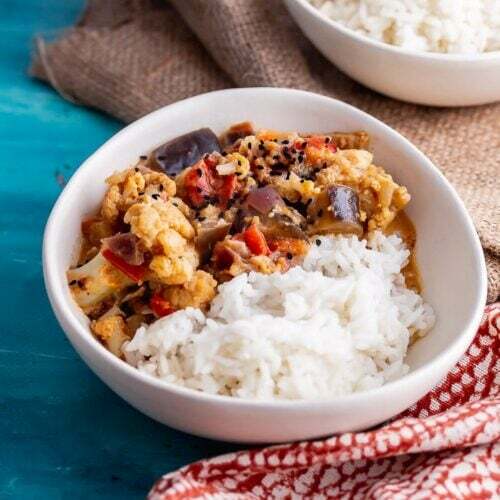 To make this recipe on the stovetop simply follow the instructions by sauteeing the onion, garlic, ginger, pepper and chilli over a medium heat then add the spices followed by the vegetables. Cook for a couple of minutes then add vegetable stock, start with 200ml and bring to a simmer, adding more liquid if it starts to look dry before the vegetables are cooked and the tomatoes have broken down. 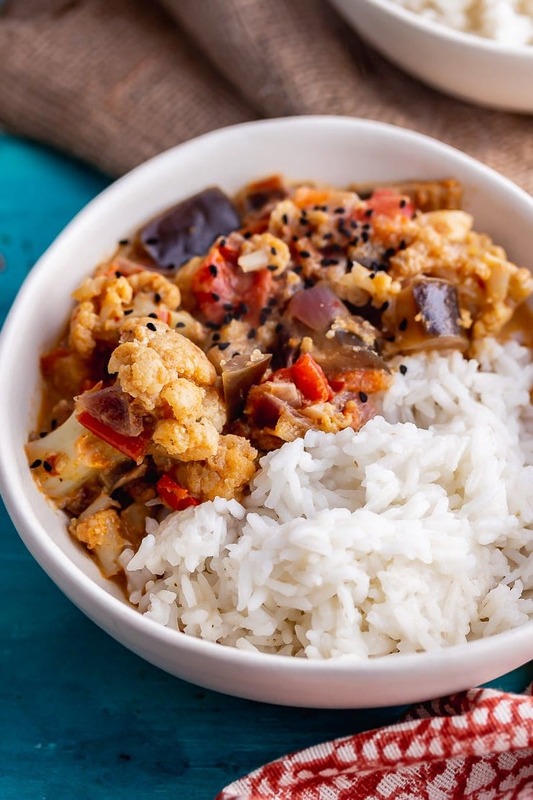 Once the cauliflower is tender, serve with rice or any other grain. 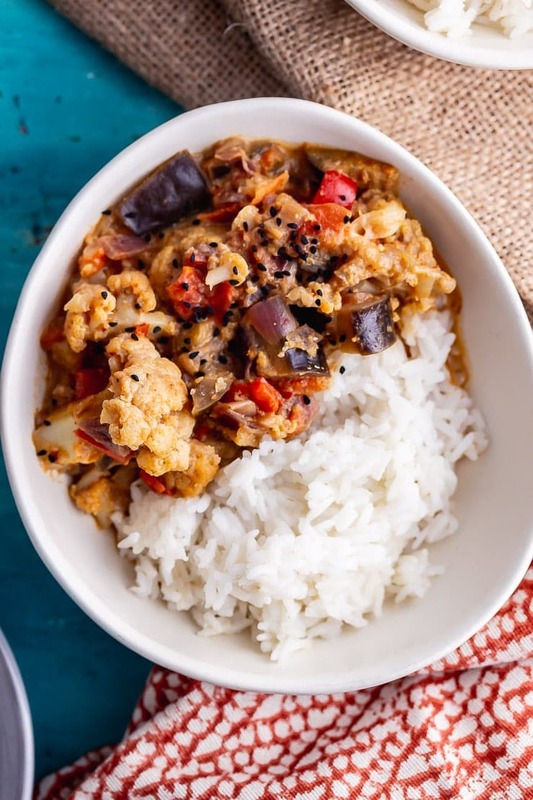 Can I make this vegetable curry in the slow cooker? You can definitely make this curry in the slow cooker. Simply add all the ingredients to the slow cooker and cook on low for 6-8 hours until the vegetables are tender and the sauce is broken down. 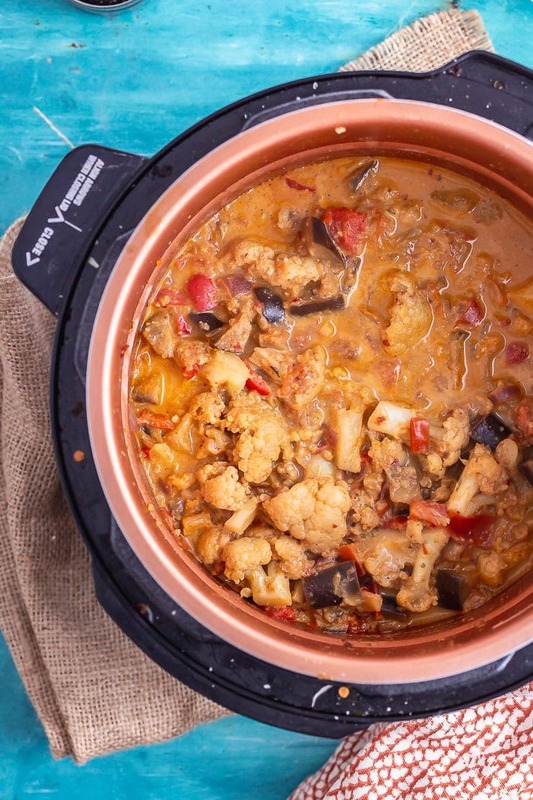 WONDERING WHAT TO DO WITH THE LEFTOVER INGREDIENTS YOU’VE GOT FROM MAKING THIS PRESSURE COOKER VEGETABLE CURRY? Set the pressure cooker to saute mode and add the olive oil and onion. Fry until softened then add the garlic, ginger, pepper and chilli and fry for another couple of minutes. 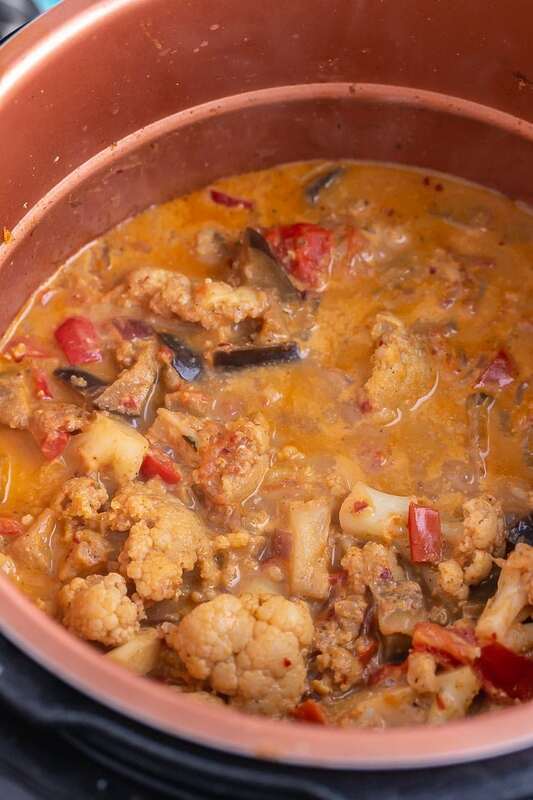 Add all the spices and stir to coat then add the cauliflower, aubergine and tomatoes followed by the vegetable stock. Stir then seal the pressure cooker and cook for 3 minutes on the stew setting or on high pressure. 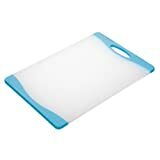 great way to clean out your fridge! loving how easy this is and with so much awesome flavor! I love how easy this is using an instant pot! Looks delicious! This has so much flavor! It’s the perfect family friendly dinner. 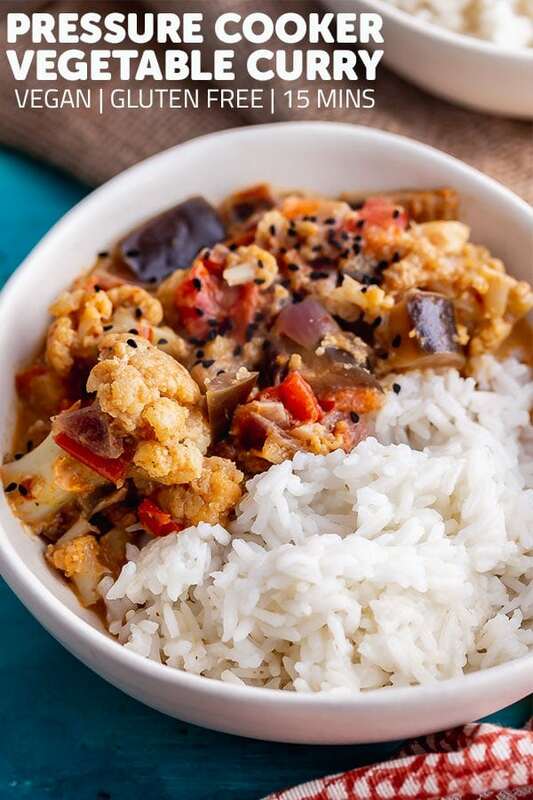 It can be so hard to get great flavor into vegan dishes, and so I love all your tips. Hauling out my Instant Pot for this tonight! Amy, you got me with healthy and “clean out the fridge”! That is definitely my kind of cooking. This curry looks rich and flavorful!